Once in a while, there's a veggie dish that makes me forget about everything else on my plate. This is that dish. There's really no point of me making anything to go with these; as long as it's in sight it's the only thing I'll ever want to eat. Overboard, you might think, but just wait till you try it. The still slightly crisp beans are coated in a sweet, creamy and nutty (but nut free!) dressing. Panko, tossed in brown butter adds even more nutty flavour and just the right amount of crunch and the sumac gives this dish a slightly citrus note. My absolutely favourite part of these beans is the mint. There's not much in here but just enough that you're left for a minute wondering what the heck that awesome taste is. It manages to stand out and compliment the beans all at the same time. Have you ever cooked with sumac before? Sumac is a spice common in Middle Eastern cooking. It comes as a dried reddish purple powder and has citrusy flavour. Some well stocked grocery stores will carry it as well as most Middle Eastern markets. If you live in Vancouver you can find it at Gourmet Warehouse. If you live in the United States iGourmet carries sumac and offers free shipping with minimum purchase. 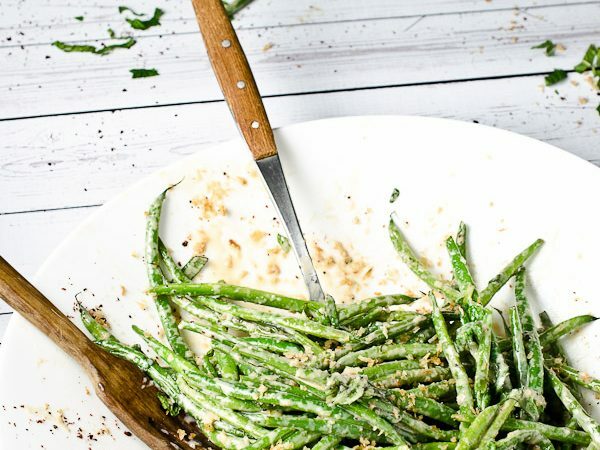 If you make these Green Beans and Mint with Crispy Browned Butter Panko and Tahini Maple Dressing, make sure to snap a pic and tag @theendlessmeal on Instagram so I can like and comment on your photos. I love seeing TEM recipes you create. 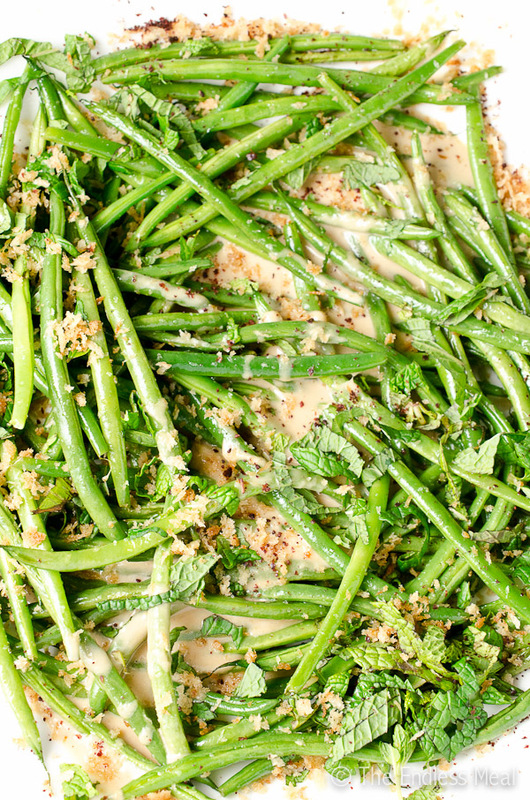 These roasted green beans are tossed with a tahini maple dressing, tart sumac and crispy brown butter panko. It's one of my favourite green bean recipes! Place the beans on the prepared baking sheet and toss them with the oil. Bake in the oven for 10 minutes, or until they have just started to soften. While the beans are roasting prepare the panko. Heat the butter in a small frying pan over medium high heat until it is very frothy. Once the froth begins to settle down remove the pan from the heat and, using a spoon, remove the froth and discard it. Place the pan back on the heat until the bits in the bottom are nicely browned. Remove the pan from the heat and stir through the panko. Note: if you are using oil simply heat it and toss it through the panko. In a large bowl mix together all the dressing ingredients. When the beans are slightly tender but still have a bit of crunch remove them from the oven and put them in the bowl with the dressing. Add the panko, mint and sumac and toss everything together well. Serve immediately with a little extra sumac sprinkled over top. You can prepare the dressing and panko up to a day ahead. The beans can be laid out on a baking sheet with the oil and kept on your counter, covered, for up to 8 hours. Put them in the oven to cook 10 minutes before you want to serve them. This sounds wonderful. I love green beans and have never tried sumac. In #3 of the instructions, do you add the Panko after you remove the pan from the heat? I could barely get through reading the title of this post before the cravings set in — this sounds insanely good, and I have all the ingredients in my kitchen, amazing! I love the tangy flavor of sumac and I’m always looking for new ways to use it, thanks! I love it when I see something I want to make AND have all the ingredients. Hope you love it as much as I do! !